House FNF: Read Not Ahead! We totally didn't use a fan's design that aped the current trend of having GoT-style house sigils and put it on a t-shirt. Okay, well, maybe we did, but we got their permission because the design they made is fantastic! 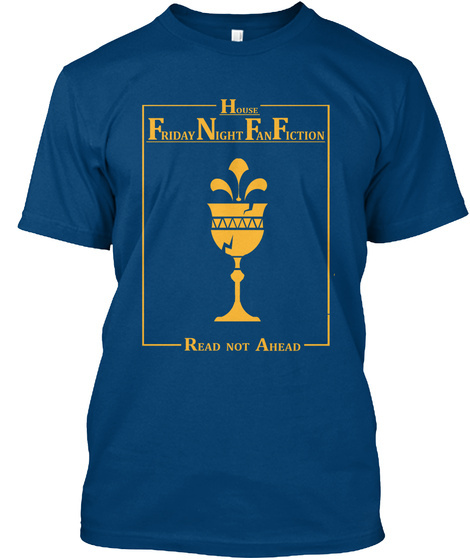 The House Friday Night Fanfiction t-shirt identifies you as one of the members of the shameful smutty house, complete with our emblem of a broken wine cup and the cardinal rule of the Friday Night Fanfiction podcast: read not ahead. May or may not come with actual pre-made wine stains.